Justice League #20 is something of a mess, in terms of both story and artwork. Reportedly, the main story was laid out by one man and then illustrated by three different pencilers and three different inkers. Art by committee works even less often than writing by committee and it really doesn't work here. Even accounting for the differing styles at work, everything looks horribly uneven. The story by Geoff Johns, focusing primarily upon the newest members of The Justice League as they fight the telepathic powerhouse Despero, isn't much better. Johns does his best but the underdogs fighting outside of their weight class story has been done to death. Not helping matters is that much of the "charm" of this issue depends upon your enjoyment of the flighty bimbo that is Element Woman or the continual squabbling of the two teenagers who make up Firestorm. And given that Fury of Firestorm was cancelled this month, it appears that the vast majority of comics fandom find the antics of Ronnie Raymond as tiresome as I did when they played this exact same conflict out during Brightest Day. There's only two things that save this comic at all. The first is the Shazam back-up story, which finally seems to be gaining some legs or maybe I'm just viewing it more sympathetically now that Billy Batson is beginning to act like the hero he should be. 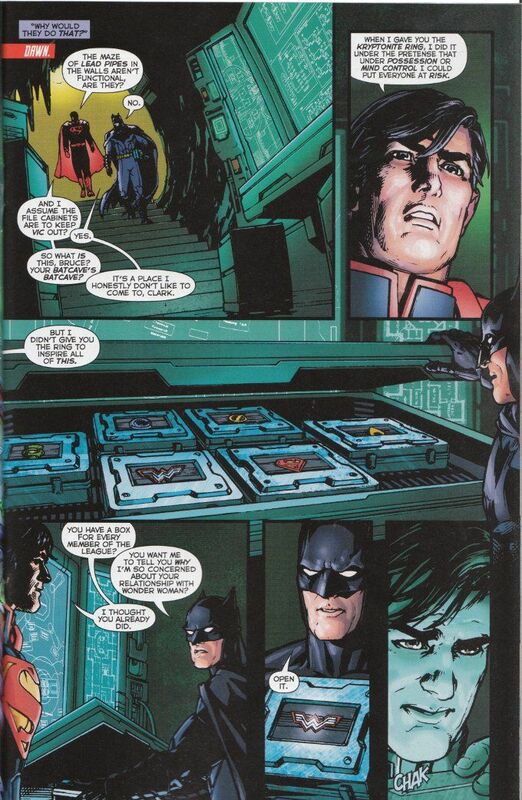 The other bright side in all this is a scene involving several of the Justice League founders and Superman having a talk with Batman about his creation of protocols to take down every other member of the Justice League... including himself. This book seriously needs one artist, one inker and one person deciding its' look. The multiple teams working on the main story this time around do not work well together. And Johns would do better to develop his new characters alongside the established crew for a time rather than throwing them all into a spotlight that none of them deserve yet.